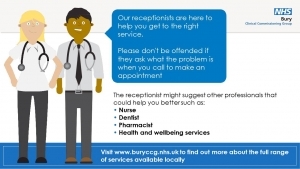 As part of our new care navigator scheme, our practice team have been trained to assist you to see the right person to meet your needs, by asking about your reasons for wanting to see a doctor. The ‘Care Navigator’ who takes your call will ask you a few questions to assess your ‘care needs’. This will enable them to direct you to the most appropriate person or service, which may not always be a Doctor; it may be another member of the team such as a nurse or your local pharmacy. Your call is always in the strictest confidence. Our GPs are asking patients to try and assist our ‘Care Navigators’ as much as they can, so we can support patients to access the right care in the right setting as quickly as possible.